Designed to meet the needs of modern Diesel and High Performance Petrol (including turbo) engines. Not only protecting diesel engines from harmful soot deposits but is designed with limits on certain chemical components to prolong catalyst life and protect expensive emission reduction systems. dexos2™ is a robust oil, resisting degradation between oil changes and maintaining optimum performance longer, a suitable alternative for most European OEM specification oils. dexos2™ Meets or exceeds API SN, ACEA A3/B4/C3. 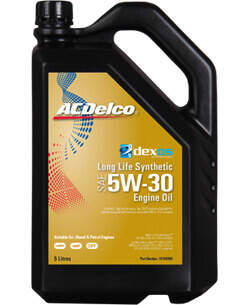 dexos2™ in an innovation in engine oil. It was developed by GM for late model GM vehicles with petrol or diesel engines, but is suitable or use in a wide variety of other makes and models. It is a low SAPS engine oil suitable for use in diesel powered vehicles with exhaust particulate filters / EGR systems and provides exceptional cleaning power, engine wear protection and improved fuel consumption.